Over thirty of the most iconic names in tennis invade the country from December 6-8 as PLDT HOME Fibr—Home’s most powerful broadband—in cooperation with Smart Communications, brings the newly renamed Philippine Mavericks in the International Premier Tennis League (IPTL)’s final leg in Manila. The IPTL, led by its Vice President for Operations Abhishek Ponia, formally bared the 2015 edition of this prestigious undertaking which stars the top Association of Tennis Professionals (ATP) and Women’s Tennis Association (WTA) players as well as s few legendary names in one is deemed as one of the most popular sports on the planet. The International Premier Tennis League (IPTL) is poised to return for a second spectacular season on December 2015. 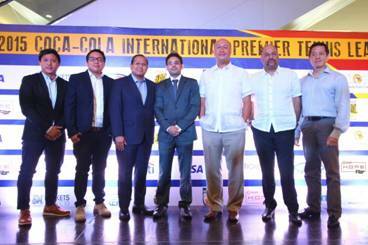 Seen at the recent press conference at the SM Mall of Asia Arena are (L-R): Smart Sports Marketing’s Christopher John Quimpo, PLDT VP and HOME Marketing Head Gary Dujali, SM Lifestyle Entertainment President Edgar Tejerero, IPTL VP for Operations Abhishek Ponia and the Philippine Mavericks co-owners Jean Henri Lhuillier, Kevin Belmonte and Haresh Hiranand. The former Manila Mavericks squad has been renamed the Philippine Mavericks to make a larger scope and not just central Manila. This was the explanation of Mavericks team co-own Jean Henri Lhuillier on the rebranding of the contingent composed of eight powerhouse names in the sport. Lhuiller, who is also the Team Manager, is joined by fellow owners Hans Sy, Kevin Belmonte and Haresh Hiranand at the helm of the Philippine Mavericks. Joining the Mavericks in the league are defending champions Indian Aces, Singapore Slammers, UAE Royals and newcomers, the Japan Warriors. The IPTL kicks off in September. This one-of-a-kind “team” tennis event commenced last year with its inaugural leg held here. Despite the apprehension that tennis—not among the mainstream spectator sports in the archipelago—may not draw a big enough crowd, the MOA Arena was a virtual sellout for the three days of competition. In 2014, the endeavor had little time to prepare and yet succeeded beyond expectations. This year, with more time, the organizers and sponsors have plenty of opportunities to iron out what little kinks there was in the initial staging and that makes for a bigger event. PLDT HOME Fibr has been synonymous to bringing world class international sports and entertainment to the country for years and having the opportunity to partner up again with the IPTL—this time with sister company Smart—only reaffirms its mission to be at the forefront of bringing only the best to the Filipinos. The 2015 Philippine Mavericks are made up of returning members Jo-Wilfred Tsonga, Mark Philippousis and former Philippine national team member Treat Huey along with new recruits Serena Williams (formerly of the UAE Royals), Richard Gasquet (a two-time Grand Slam semifinalist), Sabine Lisicki (she of the 131km/h serve and a former Wimbledon quarterfinalist), and up-and-coming stars Jarmila Gajdosova of Australia and Croatian Borna Coric. Other big names that have confirmed their participation this year are Rafael Nadal, Roger Federer, Novak Djokovic and former Manila Mavericks main attraction Maria Sharapova—who will now be seeing action for the Japan Warriors. Tickets for the 2015 IPTL Manila leg are available starting July 15th. PLDT Home Fibr will be giving selected subscribers a chance to be part of this amazing experience for free. For more information log on to www.pldthome.com.